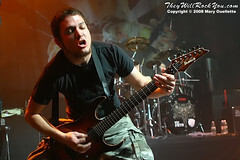 Gigantour 2008 : TheyWilllRockYou.com – For the love of music! Serving Boston and Greater New England. Let’s face it, for most metal fans, going to a Megadeth concert is pretty much taking a pilgrimage to watch one of the forefathers of thrash metal shred your face off. It’s a holy experience. For decades now Dave Mustaine has been holding the metal torch high and proud. Many soldiers of metal came before him and even more have followed the path in his footsteps after the fact, but very few have been able to grasp on to the secret to the longevity that Mustaine has sustained, including his own band members. While the band has been plagued over the years with line-up changes, Dave’s passion for Megadeth remains the tie that binds, and even though the supporting cast may change from tour to tour, with Mustaine at the helm, fans will flock. Known for his signature snarl, raucous guitar solos, and honest, hard hitting lyrics that tell tales of politics, drug addiction and other tales from the underground, Megadeth continues to attract fans new and old who aren’t happy until they have the entire Megadeth library in their collection, for those of you counting that includes eleven studio albums, six live albums, two EPs, not to mention compilation albums and extras. 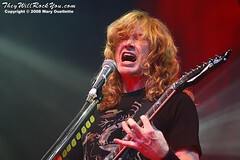 Gigantour, the now annual tour package that Mustaine put together, is now in it’s third year. Putting together the most diverse line-up of metal bands imaginable this year the tour boasts of a line up that could easily be crowned The United Nations of metal! The show kicked off with the power trio High On Fire followed by Arizona’s Job for a Cowboy opening the show and warming up the already pretty hyped up, full capacity crowd. 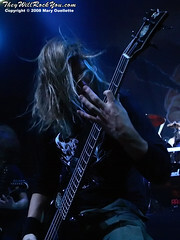 While a chant of “Bodom, Bodom” could be heard between sets, the air started to get a little thick. Could it be the pride of Finland? As Children of Bodom hit the stage, the crowd hit it’s highest point with bodies being thrown through the air and the security guards working over time to play catch. 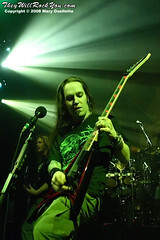 It was clear, that the Children of Bodom fans were making their presence known. Children of Bodom rocked through their set with the crowd screaming in unison. Next up on our trip around the globe…Scandinavian death metal band In Flames. They assaulted the senses with strobing, pulsating lights and death metal that burned our ears off. Again a sea of bodies made their way forward as the band egged on a circle pit. Their wish…was the crowds command. Circle pit…check. Crowd surfing…check. Full frontal projectile vomit from the dude in the front row…check. While walking through the crowd I think the most amazing thing to me was the mix of ages, the range went from teenage boys and girls to old schoolers who remember Megadeth’s first album and their original line-up. It was an equal opportunity thrashfest for all. On a personal note, seeing Megadeth was a surreal moment for me as it reminded me of someone I lost a long time ago. The only other time I saw Megadeth live was with her over a decade ago and at her personal insistence. It was hard to watch them take the stage without being overwhelmed with memories of that but it made the show all that more important to me. The first thing that smacks you in the face when Megadeth hits the stage is the larger than live drum kit on it’s larger than life drum riser, quite a sight to behold, but before you get too caught up with it, the songs begin, Dave’s snarl is in full force, and the crowd is eating it up chord by chord. 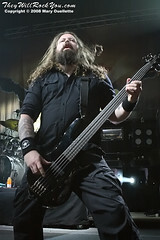 If you’re a fan of metal, check out Gigantour when they come to a town near you. 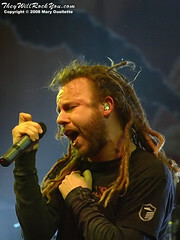 Check out the full TheyWillRockYou.com Gigantour Photo Gallery here.